Could Trump win again in 2020? Two things are certain. Firstly, Trump has lost the cornucopia of Jupiters which swept him into the White House in 2016. Secondly it isn’t going to be a joyous Obama-type win which puts the USA on a high for a few months. So neither a jubilant Donald, nor a euphoric Democratic win. 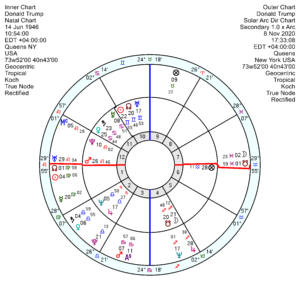 What is for sure is that it will be one of the most fraught, bitterly hostile and high-risk elections for a long time given the state of the USA 1776 chart with tr Pluto opposing the Mercury and tugging on the USA Pluto, giving rise to a mood of fanaticism and no compromise. And the Inauguration 2021 chart which looks explosive and control-freaky, with an upsurge of revolt rocking the boat. Trump will have been shuddering under the weight of tr Pluto opposition his Saturn and Mars/Node in 2019, labouring on through 2020 as well, so he won’t be as buoyant as usual. 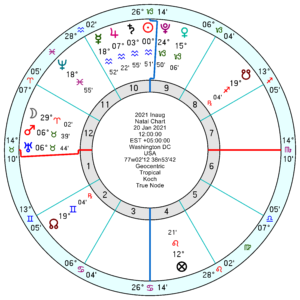 In addition in 2020 tr Pluto moves on to oppose his unpopular Venus/Saturn and hugely frustrated Sun/Mars midpoints, repeating till late 2021. 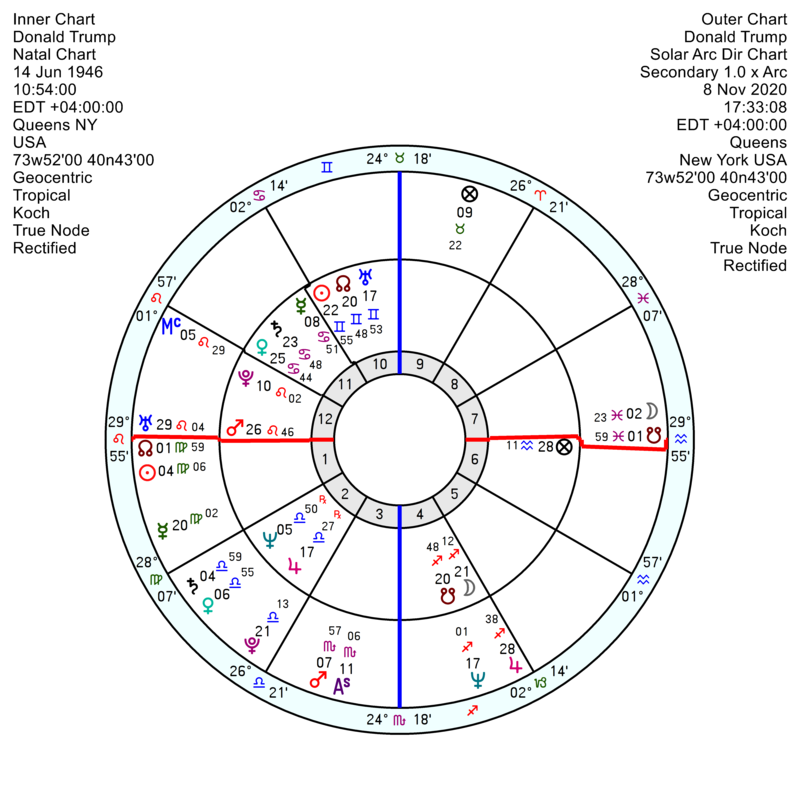 Tr Neptune will also be chiselling away at his foundations squaring his Uranus this year and Uranus/Node through early 2020 campaigning; and tr Neptune will square his Sun/Uranus across the 2020 summer and presumably the GOP Convention, which will bring setbacks, emotional crisis, physical weakness. It’s not beyond the bounds of possibility that another Republican candidate is chosen. Over the election itself he has tr Pluto opposition his Mars/Uranus midpoint which is associated with force, violent interventions, and is generally accident or disaster prone and bad tempered. And nothing very positive from other influences. 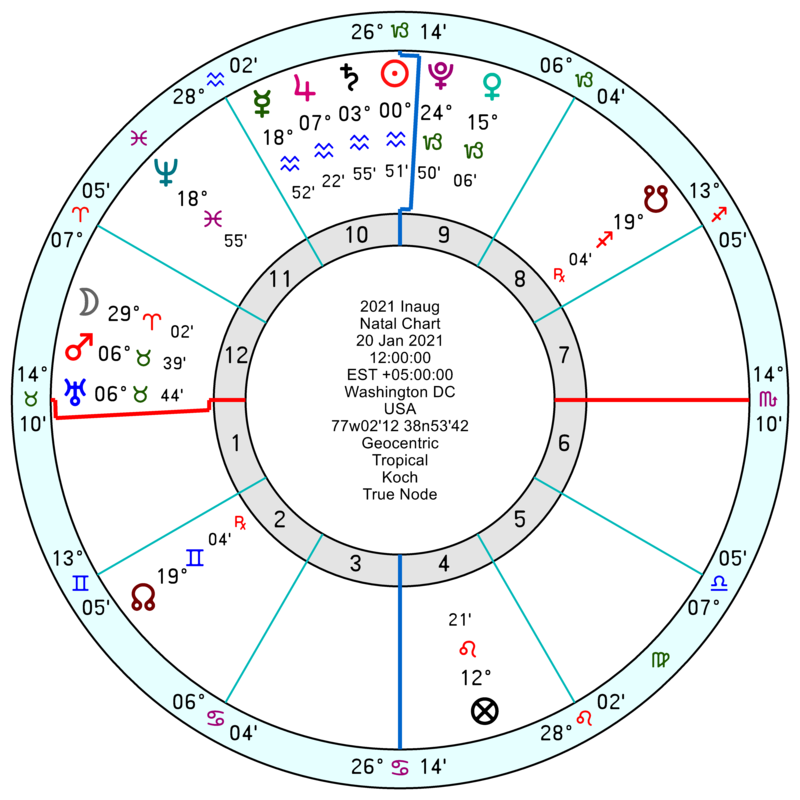 On a 10.54 am birth time for him, tr Pluto is aiming to trine his MC over the inauguration which could sound successful and influential and he certainly looks as if he is firing on all cylinders from his Solar and Lunar Returns covering the election and just after. Though they could also point to a change in career direction. So it’s the usual mish mash of contradictory influences and nothing too obvious pointing to success. The USA doesn’t look remotely happy in the aftermath with tr Neptune square the USA Mars picking up from late March 2021, bringing a panicky sense of failure; plus tr Pluto opposition the USA Mercury through till late 2021, which will continue the intense arguments. Marjorie, it’s amazing you posted this hours before DJT’s absolutely incoherent and lackluster “Wall Speach”! We’ve had similar, horrible What’s really different here, 36 hours after the speech, is that he absolutely did not manage to deflect public discourse the way he has been, in the past. Remember only in November, when he visited California and all people talked about for the next day or two was what he meant by his raking the forest comments? What’s really telling here is that his incoherence didn’t start memes. Fox News fact checked him. And, apparently, Democrat response with Pelosi and Schumer got more viewers (numbers are not public, but a media insider had them) than Trump speach on all major National Networks except Fox, and equaled Trump on Fox too. I think that what we are seeing here is people’s interest in all things Trump wading. People opposing to him know they have a fighting chance at least at The House now (and Pelosi, while not “likeable” to many, is an amazingly experienced and savvy leader). People supporting him, on the other hand, often voted for an Alpha Male, a New York Streetfighter. They will not be charitable towards an old, tired one. What so many of us are worried about is the manipulation of the voter base by the Russian bot factories and hard right-wing propaganda machines. Trump’s put so much energy into discrediting establishment media that his fans and younger voters don’t even distinguish facts from made-up nonsense anymore. His narrow electoral-state strategy could indeed propel him to reelection if he’s not impeached or indicted. Disagree. Y’all worry to much. Actions based on worry or fear would lead to his re-election. If y’all had half-a-brain, you would intrinsically know he is a liar. In news yesterday: Most people sharing fake news in Social Media in The US are over 65. Younger generation is much more educated and generally speaking tech savvy than their grandparents. The problem in The US (and elsewhere) is that they do not vote. 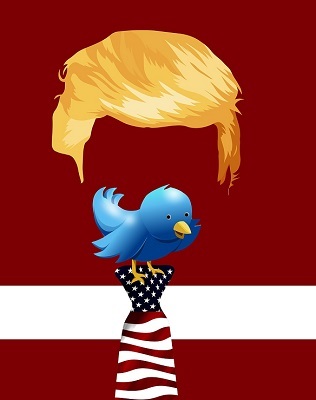 Whether or not he runs again, it’s clear that Trump is leaving scars that won’t be healed easily, and that we’re headed towards a broader system political and economic crisis in the coming years, that may be take some time to recover from. The deficit is going to be horrible never mind the state of the national pysche. The transits of the early 2020’s looks like a hangover effect. Demoralized. 2020 is going to be heavy duty time, with issues building up this year, especially after early spring. It might get some people by surprise. This whole Government Shutdown, too! I guess this will go on for at least a couple of more weeks, and the blame will be increasingly placed on Trump. This is his Eclipse square Jupiter, it really is all about popularity. There really isn’t another Democracy in the World where Government can tell employees to stay home without a pay if they are not absolutely defaulted. In countries and communities (and communities) that did, or nearly did, default, the effects have been horrible, as well. You actually see the effects in Rust Belt / Great Lakes communities that were traditionally Democrat and voted for Trump in 2016. And unfortunately, the effect will be now seen in all of The US.